Today a tutorial on how to secure your Android device and make it run through a tor network leaving you anonymous. In other words, we are going to use an app called Orbot to encrypt your internet traffic and hide your IP address by bouncing through a Tor network. This will allow you to visit the dark web through your phone. Firstly I will demonstrate how to set up Orbot & Orfox, next I will demonstrate how to use Orbot Android’s VPN features as a way to tunnel traffic through Tor and secure all your apps. 1) Load up your Android device, locate google playstore and search for “Orbot: Proxy with Tor”. 2) Next, click on the “Install Button” and wait for it to complete installing. 3) Upon installation, click on the “Open Button”. 4) Click on the “Start” button. 5) Now that it states we are connected to the Tor network, let’s check if the connection is successful. To do this, click on the “Browse” button. 6) If you see the screen shown below, click on “Install Orfox”. Orfox is a Tor browser for Android devices that allows you to access the dark web. 7) Open your newly installed ‘Orfox’ browser, if your connection is successful you will see the screen shown below. 8) Congrats! 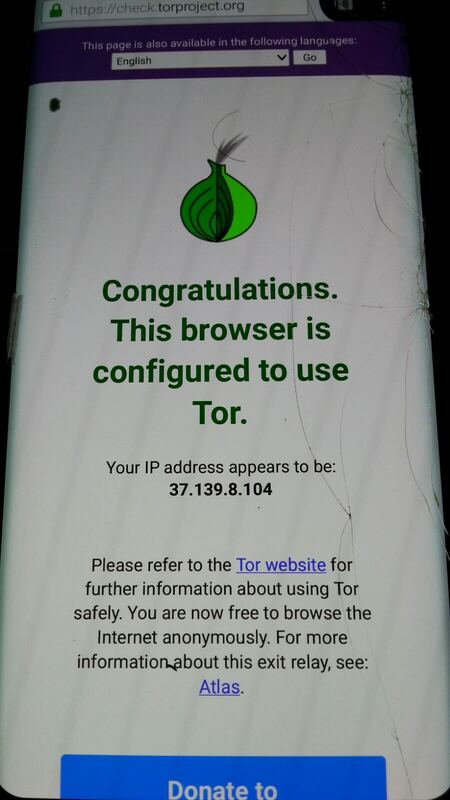 You have successfully secured your connection and are on the Tor network. Let’s check this out. 9) As you can see from the image below, my current location is Amsterdam ( i wish). But yea, that is not my real IP address. The tor connection is successful. 10) Next change your homepage to: https://duckduckgo.com/. You may then access the dark web. Next allow me to explain Orbot Vpn Mode, What is Orbot Vpn? 11) Orbot is Android’s VPN features as a way to tunnel traffic through Tor. You have to open the left-side menu, and tap “Apps VPN Mode” or tap on “Apps…” on the main screen. 11) So all you have to do to run your selected application through the tor network is to tick the apps you wish to have secured. For this example, I am going to secure my chrome browser. 12) As shown below I have ticked on the chrome browser to run through the tor network. 13) Open up your chrome browser, go to google.com and search for iplocation.net. As u can see i traveled to France in minutes. 14) You can do this for most of your apps! Remember mobile privacy is the most important..no thousand dollar phone is going to save you if you lack common sense!! So secure yourselves! P.S: Using the Tor network is a little slow as it jumps through computers around the globe, so you use it when you need absolute anonymity. Posted in Access The Darkweb, Android and tagged #darkweb, #mcsc, #messiahcybersecurityandconsultany, #orbot, #orfox, #TheMessiah, #theonionrouter, #torforandroid.